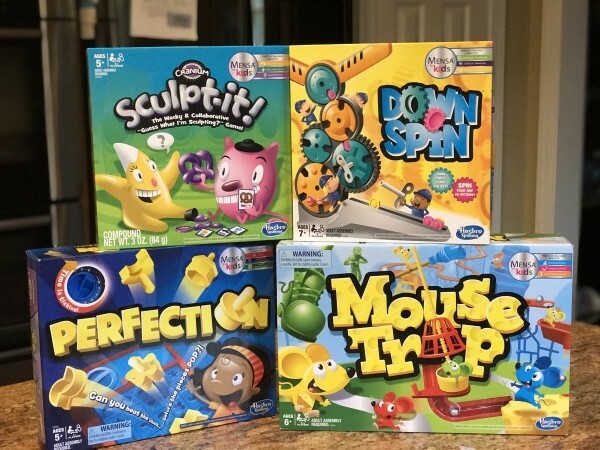 Hasbro Gaming and MENSA for Kids are joining forces to re-launch a handful of classic games including, Perfection, Mouse Trap, Downspin, and Cranium Sculpt-It. Together the games offer kids (and families) a fun way to practice valuable skills including critical thinking, focus, hand eye coordination, and more! Each of these offers different skills and all of them truly are great ways to help kiddos develop and grow. Perfection is one of our families must favorite all time games — we love playing it over and over again both ALONE and TOGETHER as a team so I’m thrilled to see it appear in this special partnership with both Hasbro and MENSA for Kids. Learn more or purchase on Hasbro’s website or at your local retailers. Combine speed, accuracy, shape recognition, and skill with the exciting classic PERFECTION game. yourself to complete the game in less than 60 seconds before the pieces are sent flying into the air. around the board collecting cheese and stealing cheese from other players…but watch out for the trap! machine, kids can practice construction skills. Kids will have so much fun playing this wacky game! parts, rubber band, 24 cardboard cheese wedges, die, and instructions. Some assembly required. Available at most toy retailers nationwide and on HasbroToyShop.com. tokens, and token bag. Available at most toy retailers nationwide and on HasbroToyShop.com. Cranium Clay, spaceship mover, alien mover, 60-second sand timer, 96 cards, spaceship card window. Note: Thanks to Hasbro for providing these prizes to our lucky winner and sending us samples to facilitate our features. As always, all thoughts and opinions are our own. We have game night every friday and we have none of these it would be perfect! I follow you on facebook, instagram, and youtube. I have tweeted about the giveaway. These games are great and thank you for the giveaway. I tweeted! Happy Hump Day!! I just love hasbro games and it’s almost Friday so Happy Thursday everyone !!!! We love to play board games and card games at my house. We always play board games and I do think that they enhance learning. Have a nice day and thank you for the chance to win this one I would love it. We love game night! I followed you on Instagram, youtube, and FB……Thanks for the fun giveaway! These would be fun for our family game nights! I tweeted! Looking forward to the weekend. Hope you have a good one. These games would be fabulous on a rainy day! This could be lots of fun. I would love to win this one. Have a great Saturday enjoy the season. Enjoy your weekend. I am hoping for cooler weather soon. It was in the 90’s today in Arkansas. Rainy day, break out the board games! I liked your facebook pg as Candace Brick Barrow. wonderful games, it’d be fun for rainy days! Love to win this one. How much fun for everyone would this prize be! These are great family games. I follow your youtube channel as well. these games would be a lifesaver! We love board games! Hope everyone has a good night. Looking forward to cooler temperatures in a couple of days. These games would be so much fun during family time! it’s great to put down the electronics and just play a game. Happy Hump Day again. Can’t wait for the weekend and I always seem to be wishing my life away! I have never played ‘Perfection’ – looks fun! Friday is finally here! Woot! Woot! I used to love Perfection! So fun, we love board games and play together everyday! Thanks for the chance! Getting ready to start a new work week. The weekends sure do go by fast. Kevin Darnell Hart is an outstanding performer and also a hilarious comedian at the entertainment industry, who had been born in Philadelphia in 1979. Today, GPS satellites continually send signals ground-ward; these signs are grabbed by GPS beneficiaries, which ascertain position. It didn’t take long for police and local groups of fire-fighters, development teams and other non military personnel activities to see the estimation of GPS. Need interior painters Roslyn? All Pro Painting Co. can completely change the look of your home. Call today for wallpaper removal Jericho or interior painting Lake Success.